A mixed-use development in a constrained location providing 18 mixed-tenure residential units and create and commercial space at street-level. The development creates a new mews street and reflects the surrounding Victorian housing. Great Eastern Buildings is a mixed-use development providing 18 mixed-tenure residential units with creative and commercial space located at street level. Formerly offices for the Great Eastern Railway, the scheme sits in a constrained location next to a railway line. A shopfront opens out to the street from the building on Reading Lane and onto a shared forecourt opposite a renovated railway arch. 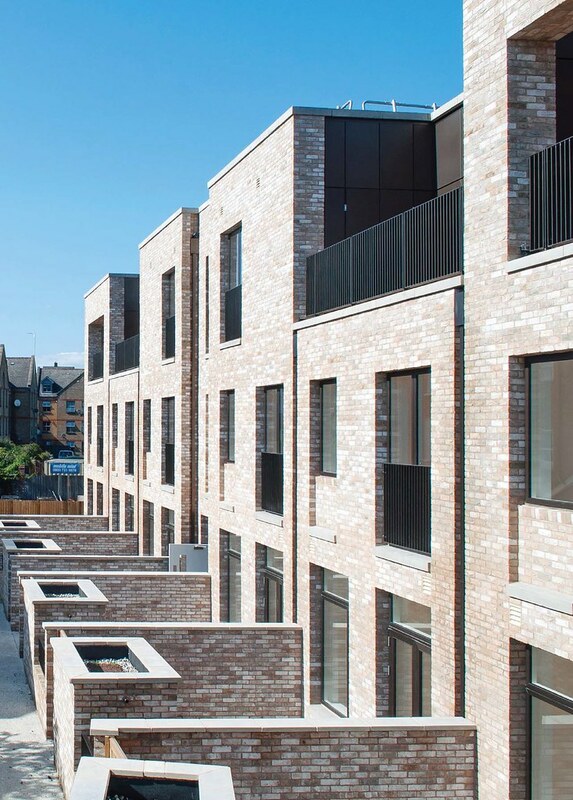 A new mews street, reminiscent of a typical London mews typology extends from the taller, street-facing building and sits parallel to the railway line in response to the narrow depth of the site. The material palette of brickwork echoes the surrounding Victorian housing in the conservation area and railway viaduct. The mews elevation interprets the elements of this typology in a contemporary manner by incorporating white brickwork at ground floor with darker brickwork above, with metal balustrading to terraces and juliet balconies. The use of a Cross-Laminated Timber superstructure responded to the depth of the site and enabled a faster build programme. Fewer site deliveries created less disturbance to neighbouring residents and minimised waste. All units meet Lifetime Homes, HCA and London Housing Design Guide criteria and benefit from generous external space in the form of terraces and balconies. Ground floor units have private patio gardens which extend out from and complement internal living spaces. The new mews street creates a space for chance meetings and well-overlooked play, whilst a rear communal garden and green roofs provide a stimulating biodiverse environment with wildflower planting. The signage strategy played a fundamental role in creating a sense of place. Collaborating with designers Alexander Boxill, ideas were explored ideas for integrating graphic design within housing. This extended to a bespoke mews gate seamlessly crafting the typography into its steel-bar construction.